Friday after work, I grabbed a bikini and dashed over to John and Maggie's home for a swim before dinner. Cousin Franny and her friend, Cassandra, from Temecula, CA were in town. Boulder City was their first stop along a road trip to New York City. Their friend, Jen, also from Temecula (but living in Henderson) also joined us. 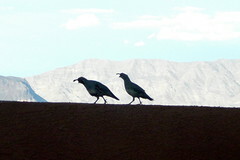 Momma and pappa quail visited us again. I missed capturing a shot of them kissing. John said that's probably why they lost all their babies to the pool because they're too busy kissing. Baby quail is still alive; that evening at least. 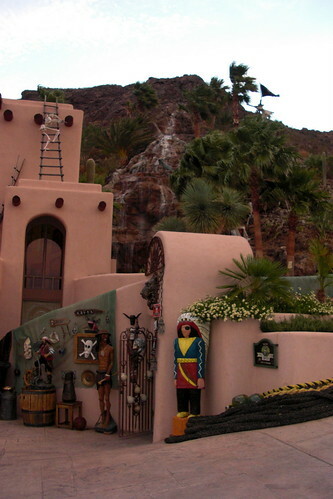 From John and Maggie's home, we can see at the top of the hill this massive house with a pirate's theme. 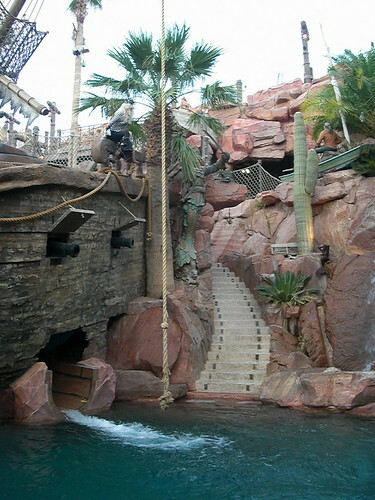 A shipwrecked vessel looms at the center of the property. We refer the marvel as The Pirate House and always wondered what it looked like inside. This evening, Franny was on a mission to make her way onto the property for a tour. Jen, Cassandra and I were equally as curious so we walked down the street and up to the hill to the larger than life home. In the spirit of where we were, Franny put on her pirate face after we were invited inside (also because the sign said No Trespassing, Pirate Only. We'll be pirates for a tour--aargh!!). 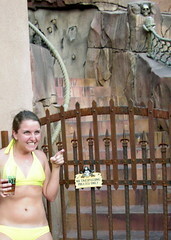 I felt like I was in Disneyland going on the Pirates of the Caribbean theme ride as we ascended the stairs. Once we were at the main level we could see to the left was a yard. Underneath the palapa umbrella, we signed a waiver in case we got injured on the property. A floor to ceiling glass wall protected the massive kitchen and living area inside. This shallow pool suits my swimming skill level...LOL. I love the table at the bar made out of what looked like beer barrels. 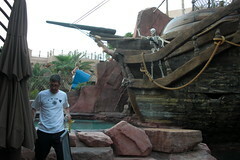 We walked on to a deeper pool where the pirate ship was embedded. The scared-looking skeleton with the snorkel gear and floaties remind me of myself if I were unsuccessful in swimming lessons...LOL. There's a water slide that starts at the top level and spiraled down two floors through a dimly lit tunnel, exiting underneath the ship. 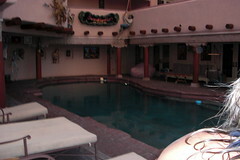 The blue mat floating in the pool can give you a perspective of how grand this pool area is. There is another bar to the left of the blue floatie or the right of the stairs that lead into the pool underneath the waterfall. After all three girls went down the slide, I finally gathered the nerve to try the slide--with a life vest on of course. O...M...G!! It was a blast!! As I swiftly moved through the windy tunnel, it felt like I was on a roller coaster out of control except I was on a mat anxiously anticipating when I would finally drop off. When I finally exited into the pool, I was so thankful that I had a vest on. Plunging into the water was disorienting. After all four of us girls went down the slide on one mat like bob sledders we toured the rest of the house. Our ride together was the scariest because with our combined weight we picked up momentum, sliding faster and faster. I was worried that we would land on each other and someone would get hurt but we made it through okay. Prior joy riders have flipped in the tunnel so laying keeping our head back and down helped us from turning over. At the top level, we could see the quiet valley and beautiful homes on this lake side of Boulder City (that is not smoke but a mister clouding my view). There was another pool and an ice cream machine (I nearly screamed). We were welcome to help ourselves at any of the bars and the ice cream machine but we were too occupied to take care of our thirst or sweet tooth. On our way back down, we observed the shipwreck. The animated skeleton at the helm was steering his ship while his fair maiden contemplated abandoning the ship. Don't jump honey, you're already dead. From our parents' home, we can see the waterfall cascading down the top of this hill. 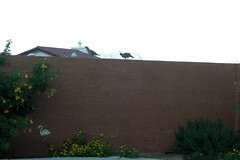 This time I got a closer view from the courtyard. Every where I look there are skeletons and pirates. I felt like I was in a town besieged by pirates! One last photo before we strolled back sporting a look as if we just off the Magic Mountain ride, soaking wet but thrilled. Dinner was absolutely delicious and fitting for a warm summer night. 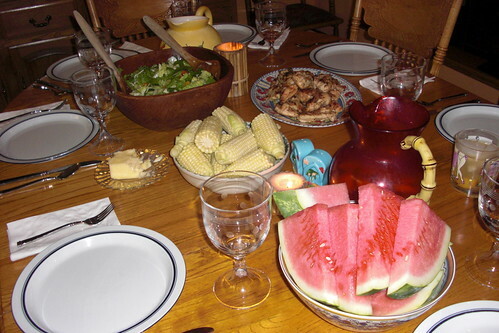 Maggie prepared grilled chicken, salad, boiled corn and sweet watermelon for dessert. What a perfect night as always. Family, friends and good food and drinks are my favorite ingredients. Is that seriously someone's home? That's incredible. What do they do for a living? It has to be something with movies! Believe or not, yes, that is someone's home but I doubt it's their primary residence. John and Maggie says the owner is rarely around. Most of the time, the caretakers are there. The house is unbelievably huge. We toured 1/8 of it or 1/16 of the property. 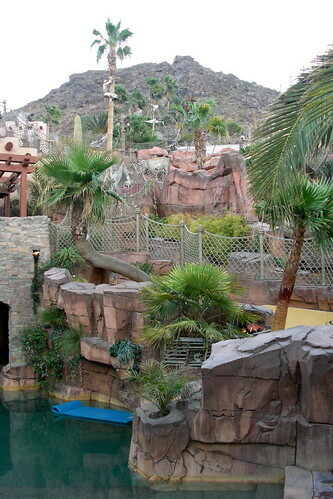 I would love to live there because the environment is so fun and had me believing I was in a themepark. Playland 24/7! That night, there was a large group of people (appears to be family of the owners). They happened to be filming that night. A commercial to advertise the property as a vacation home so they were glad us girls showed up and they filmed us going down the slide. The owner, we heard is in the health products business like vitamins and supplements. Speaking of money, my husband's parents' neighbor in Boulder City, just two doors down, have a 42-foot, all carbon fiber Outer Limit boat. It has a dual engine props with two 800 horsepower superchargers--isn't that crazy?? Him and his wife live in Redondo Beach, CA and bought this house in Boulder City just so they can store their boat in an air-conditioned garage and launch it on Lake Mead every other weekend. We talked to them one weekend and figured they fly in to the private airport in Boulder where they keep their truck to tow their boat. The owner said it costs him $1,200 in gas for fill up each time (that was before the big gas hike). He's a contractor for steel or is in the construction business or something. The carbon Outer Limits start at $947,000 (cough, cough). That's like two nice homes...LOL. Come to think of it, Corrin, I could have very well met the owners of the property and didn't know it. They were just gracious and humble in giving us the tour--even inviting us to stay for dinner. Really nice people and I am sorry we didn't have the time to get to know them better. There's a video on YouTube with more footage of the property. The home is called, Pirate's Cove. I would have loved to see the jail cell...LOL. The owner is Craig Tillotson. He is one of the founders or largest distributors of NuSkin. I think NuSkin is a multi-level marketing kind of setup but I'm not positive about that. Thank you for the info. That's sounds right, my husband told me about NuSkin. I did meet "Uncle Craig" according to the niece who gave us the tour. He's a very nice guy, who we signed the injury waiver with and convinced me to go down the slide with a life jacket...LOL!! I gotta let him know that he made our cousin, Franny, and her friend, Cassandra's road trip to New York. The girls said any other event after that evening is going to be hard to beat! I have spent two weeks staying at the Pirate House and it was the time of my life. The place is an adult wonderland! I had two one week trips there and would do just about anything to get back. Craig does own the place and is a great guy. The house is the coolest place I have ever been. @Anonymous: yes it was very kind of Craig to let a bunch of strangers tour his home (or one of his homes I should say, lol). I agree, the house is really cool!! Great write-up. We can't wait to go back! Haha, Derek the guy who posted the above comment is Craig Tillotson's son and Kenzie is his wife. The pirate house is great, I personally have been there a dozen times or so with the Tillotson family. They're one amazing family. Three cheers for the Tillotsons! Hip hip hooray, Hip hip hooray, Hip hip hooray. I have a friend who's doing a promo event for a local casino and would like to rent Pirate's Cove to offer as the grand prize (knowing full well, the weekend rental rate is enough to pay off my car, LOL). I just stayed there for a week, that place is awesome! I jumped off all that stuff - weeeeee. Finally I found it! 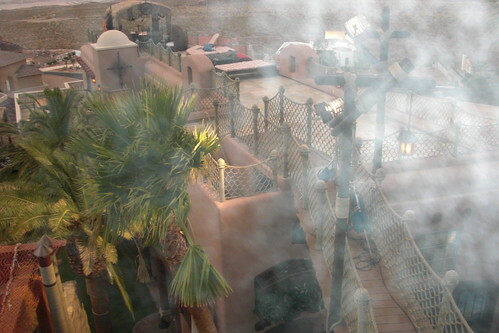 My client would like to use Pirates Cove for a private function and had me to reserch. Could you someone kindly give me information of contacts? 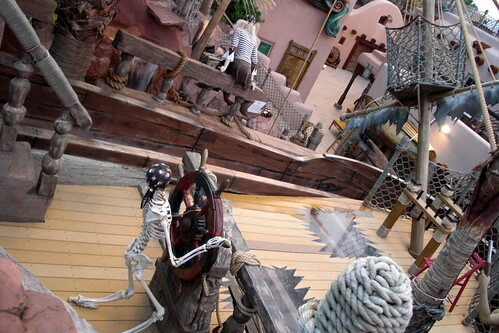 By the way thank you for cool pics and story about Pirates Cove. @jellybabe: if you are still interested, where should I e-mail the info? 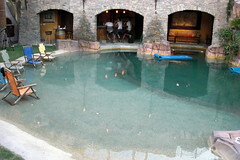 I'm trying to book Pirate's Cove for a corporate event, can you email me the info? I've tried the Elite Getaways company with info on it and their number is disconnected. My email is tdodge@apxalarm.com. Thanks! My wife and I think it is wonderful that you are so comfortable wearing such skimpy bikinis around your family and friends. She is wondering if they ever tease you for wearing g-strings at the family pool. She wears thongs/G's...but never around friends and/or family...only on vacation when it is just us. I agree. The biknis are a big turn on. Nice curves. Hey could you send me their contact info? I would like to go there for our anniversary this year, thanks! @Anonymous: no my family and friends don't tease me for wearing g-strings. it's a normal thing for me and they are so use to seeing me in them. @Catalina: I emailed the information to you. 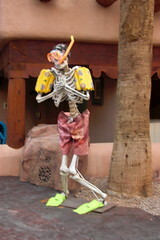 That is awesome you are planning to celebrate your wedding anniversary at Pirate's Cove -- congratulations! My husband and I will soon be celebrating our 5th. I love the pictures. 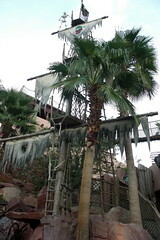 Pirates cove would be great for our 25th anniversary. Could you please send me the contact info to caspivey@gmail.com. Wow those pictures are great. I was wondering if they give tours occasionally or just rent for special occasions. My email is mirlopez99@yahoo.com. Hi there, great post! I'm another who would love to get in contact with the owners of this magnificent property :) Please could you email any information you have via donna@donnawebeck.com - many thanks in advance!